Masks are a very relevant part of every girl’s beauty regime. Everyone used to relish the benefits of clay mask since ages, Cleopatra was also one of them. Clay masks still remains to be top favorite mask and that itself speaks a thousand words about the mask. The reason is that, clay mask pulls out all the impurities from the skin and leaves the skin radiant. As per the experts, a good clay mask nourishes your skin and conditions it. Although there are many clay masks, the French green clay mask happens to be the most loved of all the clay masks and today we will learn all about French green clay skin benefits. French Green clay is very good to extract excess sebum and that makes it great for oily skin too. They encompass magnesium oxide which helps in cleansing the skin and absorbing fat from it. When you apply French green clay to the skin it eliminates the dead cells and it helps to develop new cells by increases the blood flow. It leaves the skin revitalized and smooth. French green clay pulls of all the toxic stored in the skin and thereby enhances the complexion and also tightens the pores. French green clay is excellent to expel bacteria from the skin if used on a regular basis. French green clay soothes the bruises, cuts, stings, minor burns and also insect bites. All you need to do is add 1/4th cup of French green clay powder to a tub containing warm water and sit in it for some time. This mineral bath will help to get good relief from minor skin irritations, sunburn and also gives relief from all kind of skin problems. French green clay masks are known to make the skin extremely soft and velvety. French green clay mask can be used twice a week and is great on combined as well as oily skin. French Green Clay, when combined with fresh fruits, nuts, natural oils and berries turns out to be a very nourishing treatment for skin which is nothing less than any luxurious skin treatment that you usually get from the saloons. These treatments of course do not make a hole in your pocket. 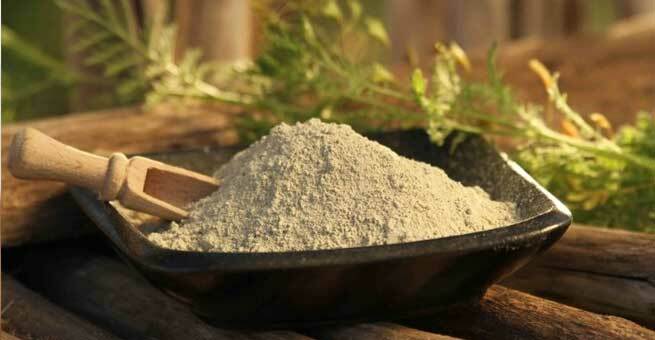 The French green clay even has a lot of medicinal properties to its credit. Note: when you purchase French green clay, make sure you are picking the one that is marked ‘pharmaceutical grade’ or which has written ‘suitable for internal consumption’. This is important as French green clay might otherwise have admixtures which could be harmful if consumed. Method: In a bowl add dry clay powder, Ylang Ylang oils and Calendula and mix well. Apply it and wait for twenty minutes and then wash off. Method: Mix all these contents in a bowl and apply it over your face and neck. Normal skin types can keep it for 20 minutes meanwhile dry skin beauties should wash off the mask in ten minutes. Wash it off with cold water and follow it with a moisturizer.